“9:30 PM and still in Committee listening to testimony since 8 AM and yet this headline. 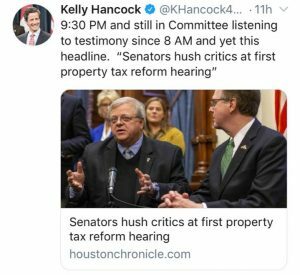 “Senators hush critics at first property tax reform hearing,” Hancock posted to Twitter. 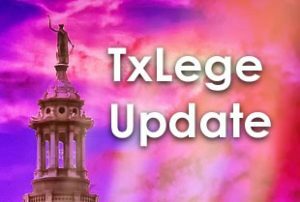 To put this in perspective: a major overhaul to Texas’ property tax system has its first real chance of passing intact in a long time. All the elements are in place: the support of the Big 3, friendly committee chairs in both chambers, and citizen taxpayers rivaling the usual cohort of local government lobbyists and elected officials opposing such a plan, which they say would tie their hands and create unfunded mandates. There were so many speakers signed up that testimony finally ended nearly an hour before midnight. Under Texas Senate committee protocol, the Senators are under no obligation to answer questions from each speaker. However, a Senator may pause the speaker for questions, or engage in some follow-up dialogue after the speaker’s time has expired. Friendly Senators (or Representatives depending on which chamber) will often ask pointed questions to ideological opponents or toss softballs to friendlies. 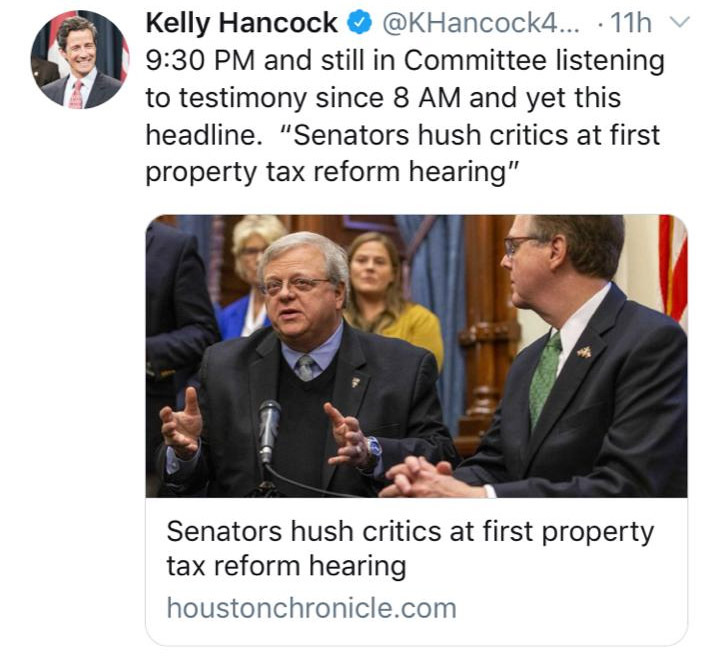 Sen. Hancock was referring to a Houston Chronicle headline (see below) which called this exchange between critics and Senate committee members a silencing tactic. Senators will often interrupt during an exchange with a person giving testimony — similar to how a judge will cut-off a lawyer mid-statement during a legal proceeding. Veteran tax cutting advocate and committee chairman Sen. Paul Bettencourt certainly had moments in which he grilled local government officials who said the tax relief would be negligible. Analysis: It is usually the elected officials who call argumentative taxpayers out of line and disrespectful when dialogue becomes heated. In these cases, no witness can ever be accused of “hushing” committee members, aside from a few zingers or making some solid points. But when the shoe is on the other foot (and now that it is), it’s regrettable to see a mainstream media outlet call this common debate practice an effort to “hush” the opposition, even if opponents now find themselves in a position to be “bulldozed” (see article). This is how the committee hearing process works — especially on a spirited issue such as local ad valorem tax reform. Disagreement should not be interpreted or framed as as official silencing. If by “hush” the headline meant Hancock’s Bettencourt’s, et al. arguments were compelling enough to shoot down contrary points, then this writer agrees. But a little “bulldozing” is expected, and turnabout is fair play.